It's August! And I've officially stopped cooking. Nearly every week, at least a couple of times, we have our 'fancy picnic' dinners, which consists of emptying out the contents of the refrigerator into bowls and putting it out on the table. We all love it! 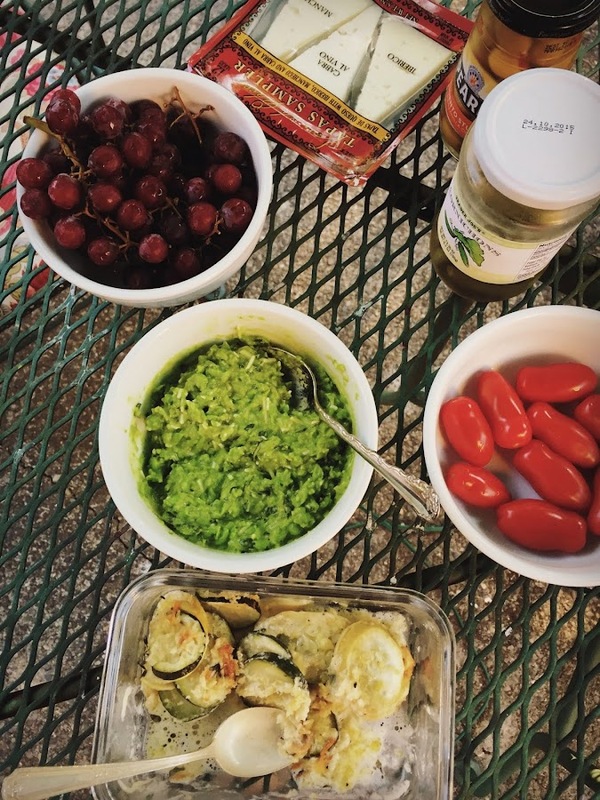 Over the weekend, I made up Minty Pea Spread (from Dinner A Love Story) - it takes less than 5 minutes to prepare and Andrew and I are WILD about it, we make it every summer when our mint gets out of control. Julia doesn't love it, but that just means more for us! Our 'fancy' picnics usually include a combination of the following: salami, olives, some kind of bread, whatever kind of cheese we have around - I like brie, Andrew likes gouda - in the above picture, we set out some manchego and other spanish cheeses, tiny tomatoes, almonds (if you can get, or feel like springing for marcona almonds, you can pretend you're in the Mediterranean) or walnuts, little pickles, a fruit of some kind, fig or quince paste (sometimes we ponder whether our year old fig paste has gone bad and I then go get another container). I LOVE quince paste and brie! I could eat whole vats of brie and quince paste. But I'm sure that wouldn't be prudent. The other day I made a zucchini and squash gratin - based on a recipe from Martha Stewart, except I just threw it into the oven and didn't pre-saute it - it took a very long time to cook and next time I'll just follow the recipe like I'm supposed to. It was insanely delicious. Andrew and I have been having our fancy picnic dinners since before we were married. What I haven't figured out yet, is how to make a fall or winter rustic or fancy picnic dinner. I need to try and figure that one out. I love throwing stuff on the table and saying, "Here, make a meal." Then they look at me like I'm crazy. Sigh. Your photo looks so yummy and inviting, though. Another favorite (???) is the 'clean the freezer' meal - that usually yields some odd results! Like fish sticks with steamed pork dumplings, ha ha ha. I heart gratin anything. This looks fantastic. I've been making my own yellow squash gratin. But it's not quite right. Perhaps Martha will lead me to the answers. I find Martha is often the answer to many questions....ha ha ha ha!